Article originally appeared on Picky Peaches. In downtown Milledgeville, Georgia, located within easy walking distance of the Georgia College and State University campus is our first restaurant, Aubri Lane’s. Housed in the former Milledgeville Banking Company building, circa 1884, Aubri Lane’s is truly a gem with a sophisticated ambience you would expect to find in a large city. When you enter, the view of the two-story dining room is jaw-dropping. Aubri Lane’s is a spectacular choice for friends and family, and children are indeed welcome. 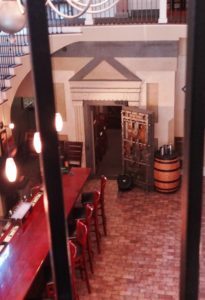 Be sure to request a table upstairs so you can have a view of the bar and dining room below. Dining upstairs will also give you a better look at the former bank’s original pressed tin ceiling. Or, request by reservation, the cozy table for two inside the old bank vault, which has been converted into a wine cellar. 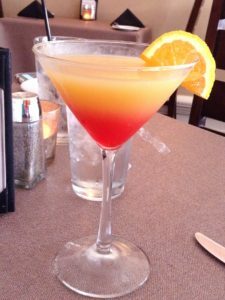 The Georgia Peach cocktail is a refreshing start to the dining experience. It’s so pretty that you’ll want to look at it for awhile, but go ahead and sip. You’ll be glad you did. If cocktails don’t appeal to you, or you’re the designated driver, order the sweet tea. It’s crisp, fresh and sweet without being syrupy. There’s also a full bar and an extensive wine list. save room for the main attraction because the urge to eat the whole basket is overwhelming! Kickoff your meal with the award-winning Aubri’s Pimento Cheese, which is served with assorted seasonal vegetables and crispy baguette slices. It’s the typical pimento cheese that your mama served, but with a touch of Worcestershire and cayenne. The generous portion is enough to share. 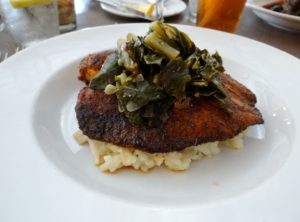 It’s easy to see why the Blackened Tilapia won “Best Seafood” at the Deep Roots Festival. Spicy, crispy and oh so tasty. The mushroom risotto, spinach and lemon butter elevate this version to the next level. 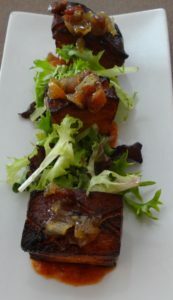 olive tapenade, the salmon is moist and flavorful. Accompanied by a broiled, bread crumb topped tomato and a mashed potato fritter, the mix of flavors and textures is perfectly balanced. The price point is mid-range, but well worth it for the ambience, the history of the establishment, and the chef’s creative use of flavors. The service is excellent and friendly. They did not hover but were close enough to adequately take care of our table. Psst! The restrooms are a bit on the glamorous side. We appreciate the privacy of full walls instead of pre-fab stalls. It’s the perfect place to touch up your lipstick and other girly things. Aubri Lane’s hours: Open 5 p.m. until 10 p.m. Tuesday through Saturday. Closed Sunday and Monday. If you decide to visit, be sure to mention that you saw it on the Picky Peaches blog.